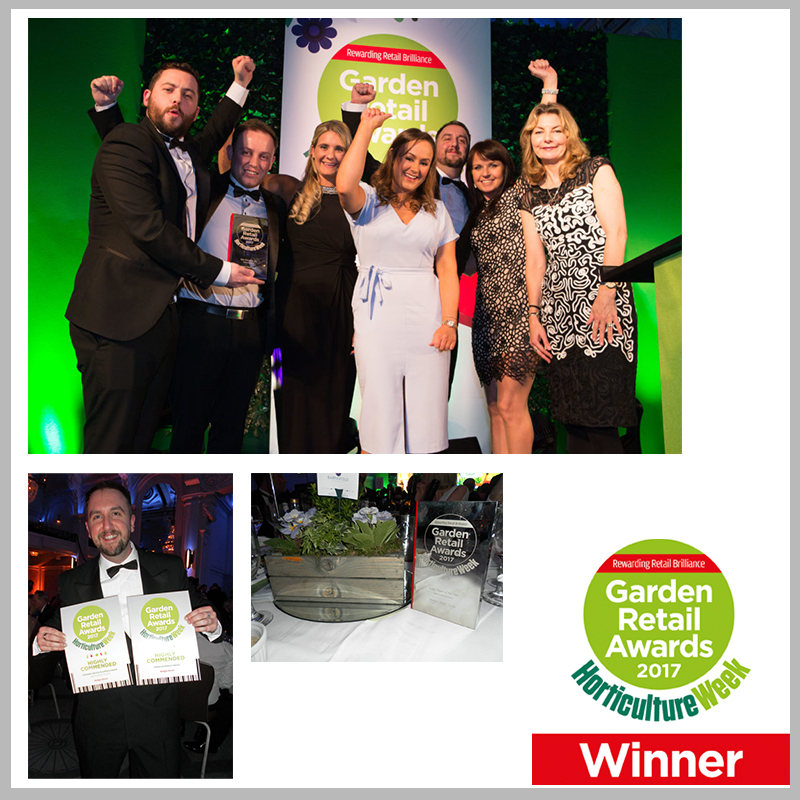 Hedges Direct was awarded sales team of the year at the Garden Retail Awards 2017. Leading industry title Horticulture Week hosted the awards at the Grand Connaught Rooms in London with host for the night comedian, Jo Caulfield. The event was very much a success with over 300 landscapers and garden professionals in attendance. We wanted to put ourselves forward to recognise our outstanding achievement throughout the year and celebrate success in driving the business forward. Our team were so overwhelmed when we were shortlisted for three awards, and not only did we scoop sales team of the year, but we also went away with a highly commended within the Customer Service Team of the Year category. The company has experienced huge growth in 11 years of trading, going from a laptop and a shed to a market leader with over 40 staff. None of this growth would have been possible without an excellent sales technique that continues to drive the company forward. Our sales staff are experts in the field as they guide the customer through the often confusing process of choosing a hedge, planting and aftercare. They also post impressive sales figures that consistently improve year on year and as a result of their hard work, the company’s turnover has increased 28% on the previous year. A recent change in the organisation of our customer facing team means that we now have a team dedicated to the care and service of our existing customers and ensuring that everything goes as smoothly as possible. The team are also fully prepped to advise new customers on which plants best suit their needs and ensuring the ordering process is simple. The creation of this new team also means that our sales team can focus their time on new or returning business, ensuring that their efforts are contributing directly to increasing revenue. Customers are imperative to success and we pride ourselves on the high levels of customer service we provide. Independent review site, ‘Feefo’, holds over 17,000 customer reviews in which we have a 96% rating. This incredible percentage stems from the dedicated and highly experienced staff who offer expert advice for each individual planting objective along every step of the way. Year upon year our customer service team grows and matures just like the plants we sell and this year is no different. With additional team members, updated online systems and new relationships with distributers and growers,we are able to help customers in every way possible. Hedges Direct were also shortlisted for the Online Excellence Award. Across our two sister sites we received 2.2 million visitors in 2016, a 33.6% uplift on the previous year’s traffic. With an ever increasing online catalogue of over 100 hedge plant species from a wide range of growers in the UK and Europe, Hedges Direct can proudly boast being experts in the horticultural field. Working within a business that has achieved so many incredible things in its decade trading has stamped an incredible atmosphere on the teams at Hedges Direct. We achieved record turnover, introduced a significant amount of new products and found new ways to offer an exceptional service to our customers. Plant For A Spring SpectacleFor the love of dog! Prune Dogwood now to get radiant colour in winter.